Inspiration for your projects and proposals, created in Excel with GraphicSchedule. 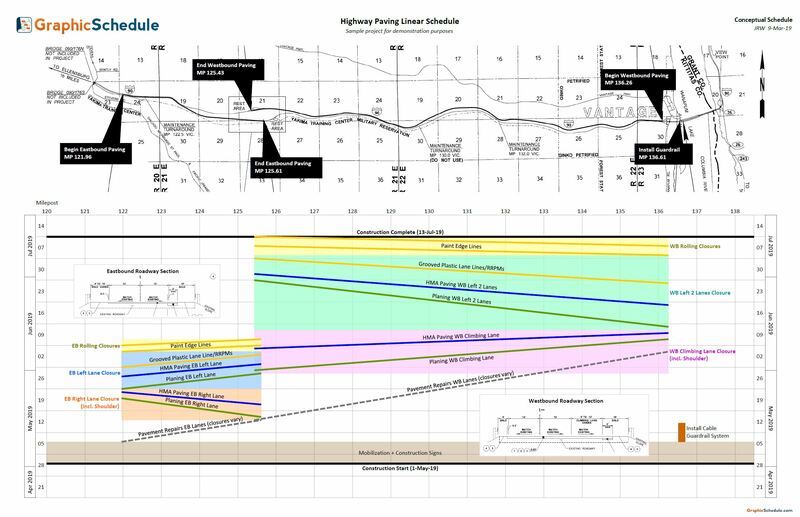 This linear schedule illustrates how repairs and resurfacing of a major interstate highway can be completed within lane closures, to keep traffic moving through the work zone. The overall construction sequence is dictated by the use of a planing (milling) machine that grinds down the existing roadway surface, and a paving machine that lays down new hot mix asphalt (HMA). As soon as these key activities are done in the eastbound lanes, crews and equipment move over to the westbound lanes to continue their work. Colored block shapes indicate the duration of each lane closure, and the map and roadway sections were clipped from the engineering drawings to provide helpful visual aids for discussing the work. Design-build projects are often split into packages so that critical portions of the work can proceed while the design of other project elements is still being finalized. 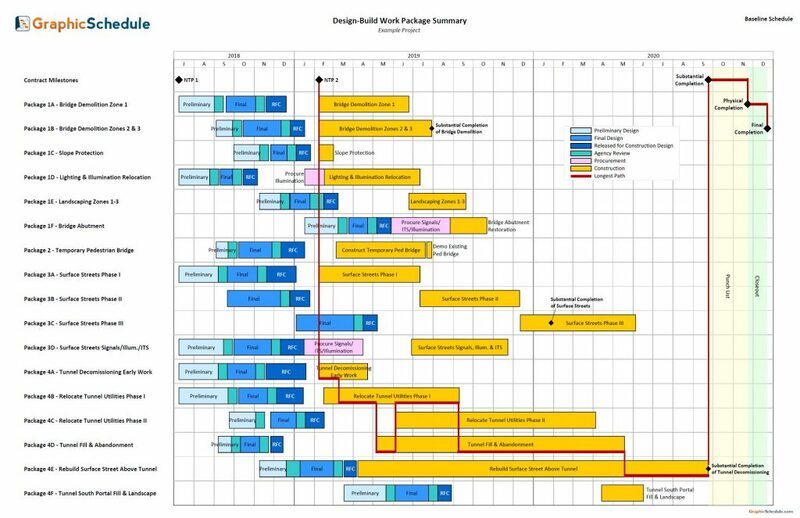 On this bar chart each package has its own row, advancing through the preliminary and final design reviews to Released for Construction (RFC) status. A red line has been added to show the longest path through construction. This one-page format also makes it easy to check planned vs. actual design progress across all packages- simply draw a vertical line down the page on any given date, then mark it up with current status of each design review to see if they’re on track. Illustrating the construction sequence for a new electric transmission line crossing urban, rural, and environmentally sensitive areas. Activities are plotted by time and location to help the team visualize how the schedule works. Seasonal environmental restrictions require adjustments to the construction sequence near the midpoint of the alignment to fit the work within available work windows. The map promotes greater awareness of the project surroundings which is key to planning and executing this challenging project. 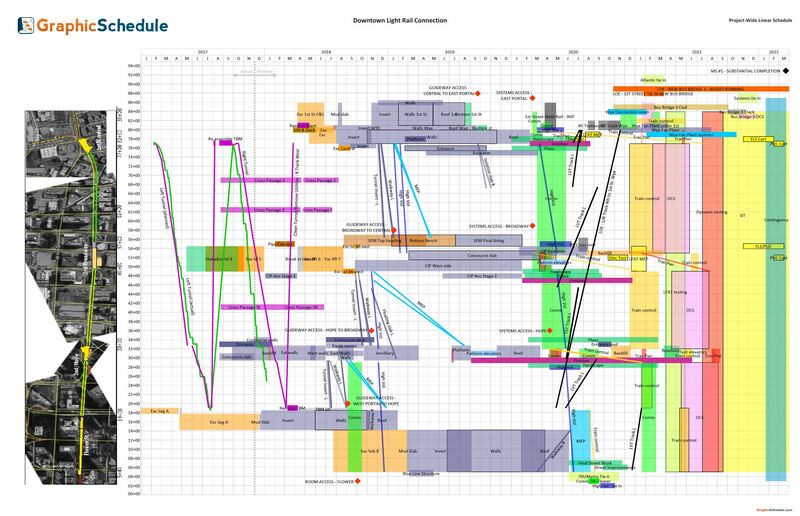 Communicating schedule, cost, work status, and forecast information for the development of a new infrastructure project. Baseline and current schedules are plotted in different formats for comparison, with links to data from MS Project. The program experienced substantial delays which in turn affected the cash flow forecast, so a native Excel chart with cost curves was placed on top of the GraphicSchedule chart to show the impacts. 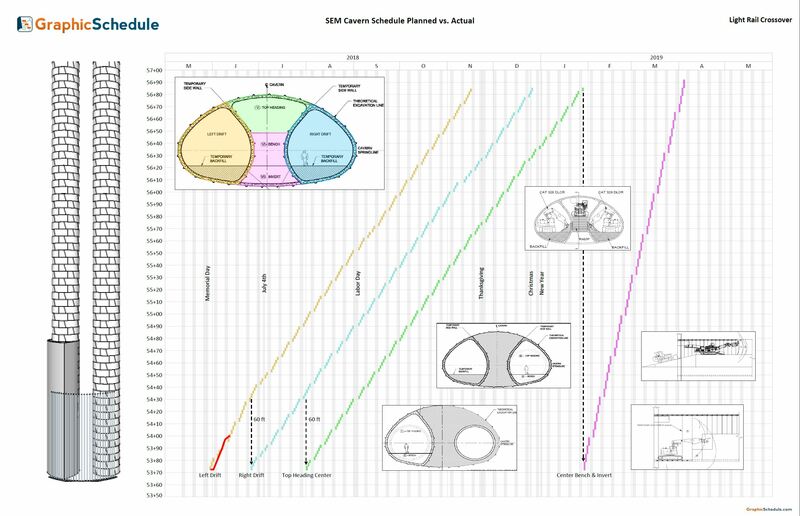 This 1-page tool has been very effective in keeping the project team and stakeholders up to date on how this program is progressing. Brainstorming an effective way to deliver this large and complex program involving dozens of major construction contracts. Dates and durations were linked using simple Excel formulas, allowing the pursuit team to quickly and easily generate alternatives and what-if scenarios. This helped the team propose an alternative approach to contract packaging that could shorten the overall schedule for completing the program. Visualizing the plan for excavating a large underground cavern for a crossover between tracks on a new segment of light rail using Sequential Excavation Method (SEM) techniques. Actual progress is plotted on top of the planned sequence using GraphicSchedule’s “linear progress” feature. 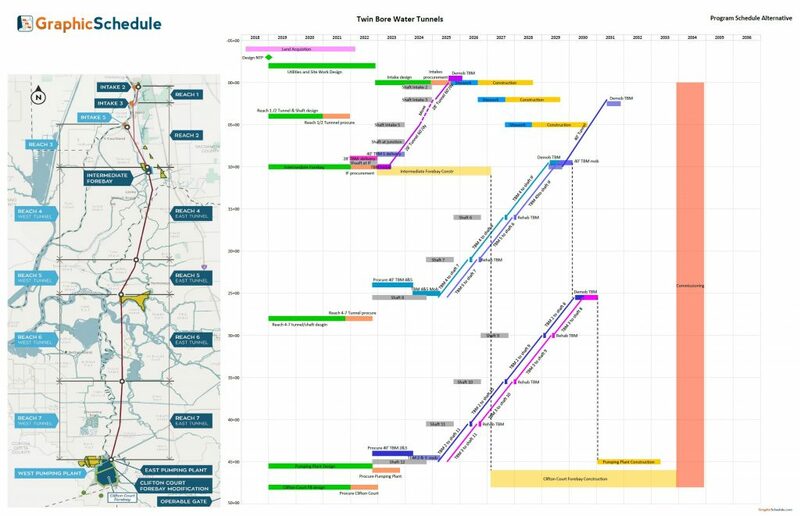 The informative cross-section graphics show how the drifts will be excavated and supported around the existing running tunnels, helping the project team communicate this complex sequence of work. 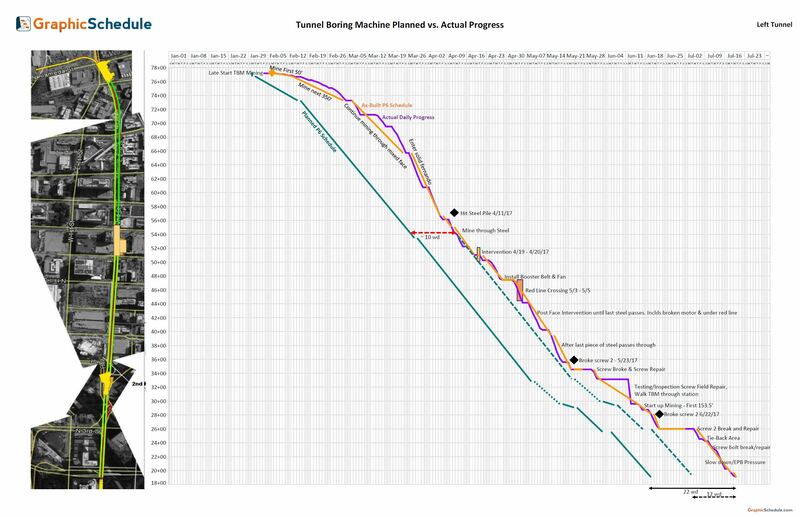 Plotting the TBM’s actual daily advance, using data exported from Tunnelsoft TPC®, a real-time data monitoring system. The planned activities from the contractor’s P6 schedule were also plotted to help the team track progress against plan. 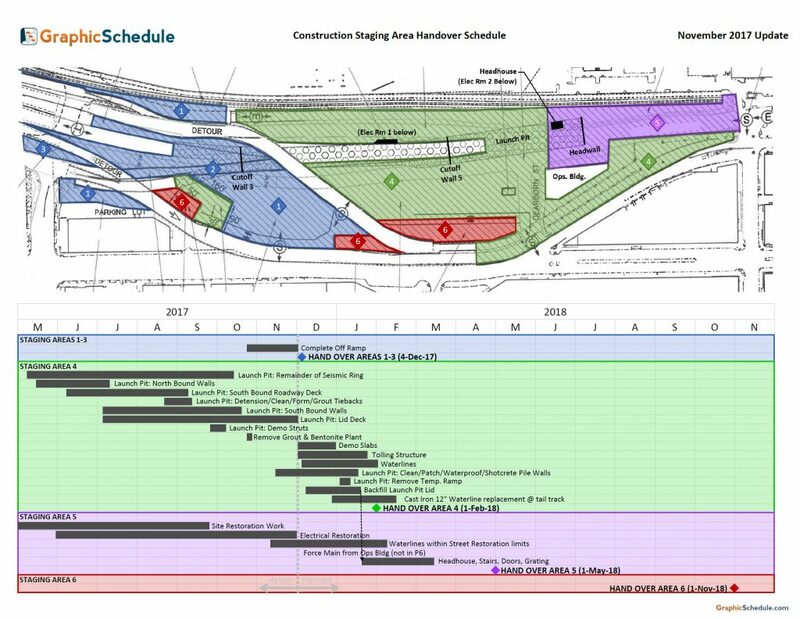 Text box callouts were placed on top of the GraphicSchedule chart to document any delays or differing site conditions that affected tunnel production. 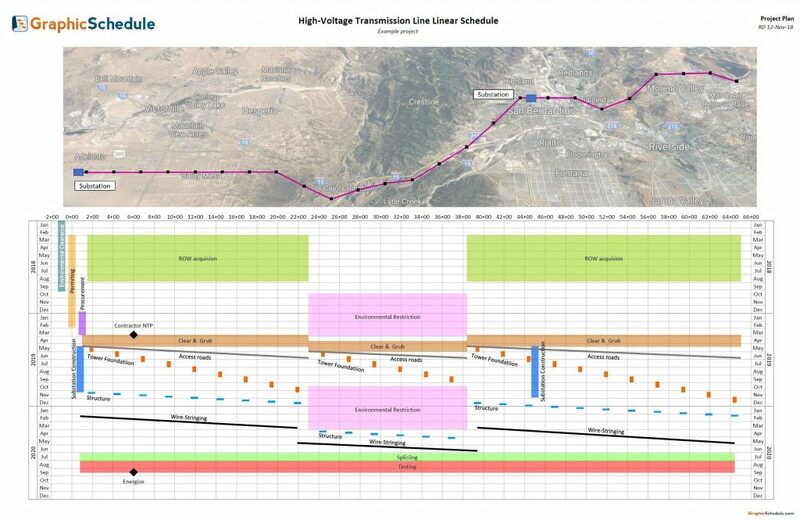 This proved to be an effective tool for communicating the tunnel production story, evaluating the impacts of differing site conditions, and negotiating time impacts for proposed change orders. This swimlane schedule answered the question “When are we required to hand over our staging areas?” and “What’s left to do in each area?” Summary activities were linked to the contractor’s P6 schedule for rapid monthly updates. This schedule was shared with contractors, construction managers, program managers, executives, and 3rd parties, all of whom needed a better way to see how this critical-path handover between projects was progressing. Helping the project team visualize the contractor’s planned sequence for systems installation in the upper roadway of a large-bore tunnel. Each line segment was linked to one activity in the Primavera P6 schedule (161 total activities) for rapid updates each month. The 3D rendering was inserted on top of the chart to provide a helpful visual aid for discussions about the work. 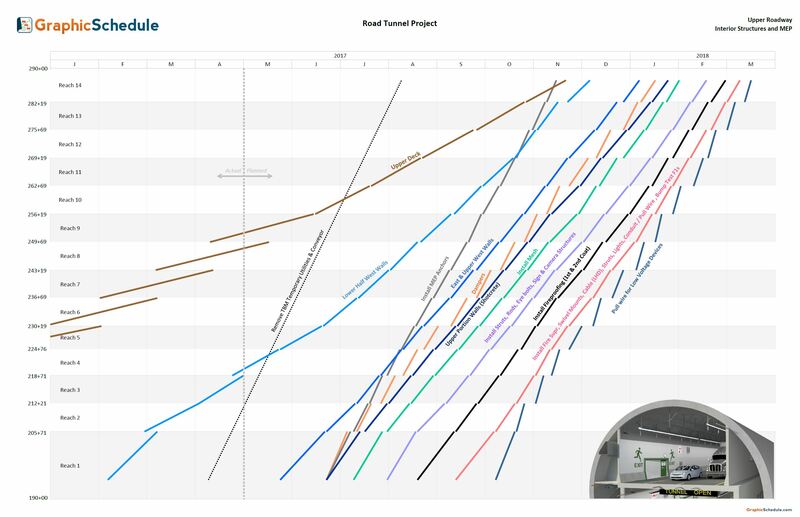 This linear schedule was developed from the contractor’s 7,000 activity P6 schedule to visualize the relationships between tunneling and subway station construction. This one-page summary helped facilitate discussion and analysis of delay impact mitigation, and how the critical path flowed through the various project elements. Monthly updates were easily generated to facilitate the formal review of the P6 schedule submittal. I’ve been drawing linear schedules by hand and with Excel for decades. I wish GraphicSchedule existed 20 years ago! 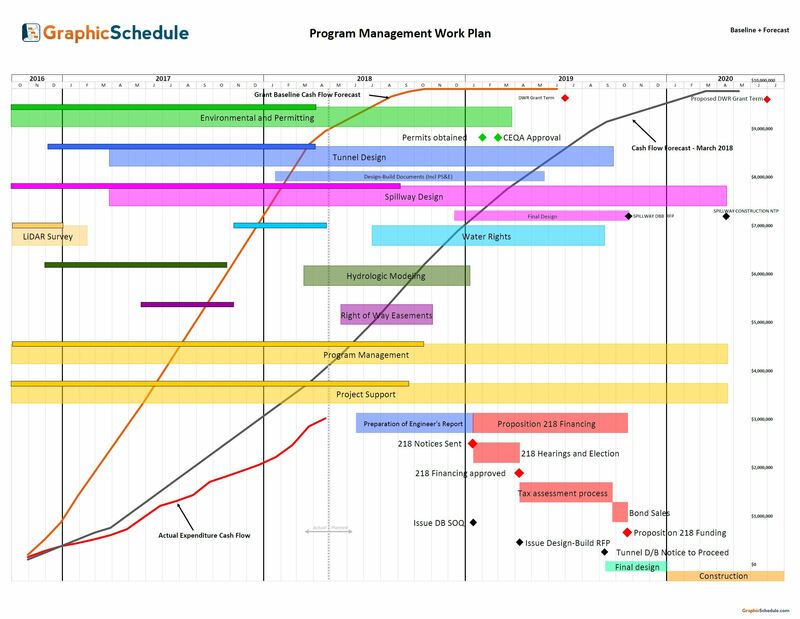 GraphicSchedule has helped improve our project and program reporting a ton! It’s a great tool to help communicate schedules to a wide audience using a familiar Excel format.